In the long run, it pays to become a welder, trained through Union apprenticeship. Welders works in every area of the construction industry where metals and alloys are joined, including structural steel, and every type of piping system that is available. In the piping industry they are called upon to join structural steel for brackets and supports for systems, as well as completing welding processes on all types of specialty metals that are used for process piping. These processes require a high degree of hand to eye coordination to complete the required work. The welder has to be able to work in many different areas, in all types of positions to complete work. They also work with programmable electronic and robotic welding equipment for specialty work. 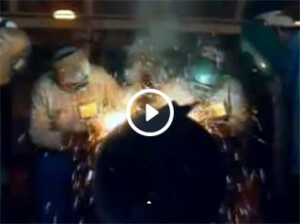 Welders weld on structural steel industry as well as piping. They deal with the installation, maintenance, and repair of piping systems. However there are differences in where the work is performed, the types of piping involved, and the training required. To install a typical piping system in a commercial building or industrial plant, a welder will study blueprints, drawings, and specifications to determine the type of pipe and tools to use to complete finished welds, and lay out the sequence of tasks. Sometimes they will make detailed sketches for pipe and equipment fabrication and installation, and as required, measure, cut, and weld various alloy piping and carbon steel, using electric and fuel cutting and welding equipment to complete the task. They also measure, cut, and weld various types of structural steel for plants, buildings, tanks, and vessels of all shapes and sizes, and at times use specialized computer welding equipment to complete high purity welds. Training to become a welder is available through a Union apprenticeship program offered by the United Association of Journeypersons and Apprentices of the Plumbing and Pipefitting Industry of the United States and Canada. The application process to become part of the Union includes, in most jurisdictions in Canada, that you must be at least 16 years of age and have a minimum Grade 12 education. Welding is a complex, analytical trade, and taking courses in mathematics and science, as well as having good oral and writing skills, are necessary in preparing yourself for a career as a welder. An apprentice is someone who learns a trade by working under the guidance of a qualified Journeyperson in the trade, so that they can ‘learn while they earn’. You get paid by the hour while working on the job site. Apprenticeship is both an ancient tradition and a highly effective modern training method, one which is still proving to be the best system for trades training. It is a highly rewarding career path for an individual who is motivated to learn the piping trade, and become an active member of a proud and noble trade union. The rewards of Union apprenticeship training are the good wages and benefits you receive as a skilled craftsperson. You’ll be working under the protection of a Union contract with insurance, pension, and health and welfare benefits. In the long run, it pays to become a welder, trained through Union apprenticeship!